Program director of the Beverly domestic violence unit Zayda Gonzalez places paper tear drops on a tree outside Beverly City Hall. 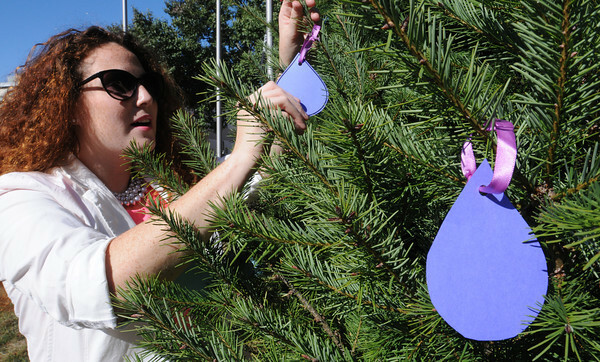 The Beverly Police Department's Domestic Violence Unit later unveiled the tear-drop covered tree display to mark Domestic Violence Awareness Month. Each tear drop represents a victim who has been served by the Beverly domestic violence unit. Photo by Ken Yuszkus, The Salem News, Tuesday, October 01, 2013.